K. Holtz fiberglass bass bows are designed with beginning players’ specific needs and budgets in mind. 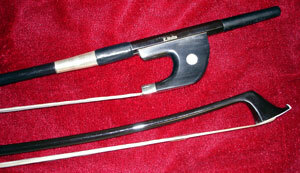 These strong, well-balanced, attractive bows produce a smooth, clear sound without a lot of physical effort from the player. Holtz FG bows are made with a fully lined ebony frog mounted in nickel silver and mother of pearl, silver-plated wire winding, leather grip, and come standard with Mongolian horsehair. The bass model is available in both French and German models.